From the Accident Review Committee. The focus of this edition: flying near water. History has shown us that there are a number of grave, and usually predictable, dangers and pitfalls for foot launched pilots. Notable pitfalls include: flying in conditions that are too strong; flying when not current; flying sites that are too demanding; and - the focus of this edition - flying near water. A recent event in which a pilot was flying a ridge soaring site near a lake highlights the danger of flying near water. While flying he noticed that the wind was changing rapidly, and before he landed it had switched to an offshore wind. Wait, what? This had never, ever happened in the history of the site. Imagine how betrayed the pilot felt when his wingtip ended up in the water during his beach landing. This pilot was ok but it highlights how unpredictable an inadvertent water landing can be. They sneak up on us and it’s scary. The reasons for water landings are varied and many. While we can't list all of them, we are compelled to point to the following scenarios: maneuvers malfunction; blown landing approach; blowback over water; innocent wingtip that falls into a body of water; miscalculated glide to a beach location; and insufficient landing area due to tidal changes. It is widely known that when a parachute lands in moving water the results are often tragic. The two don't mix and just about anything is a safer option. Pilots are almost always better served by landing in trees, or even on rocks, before choosing to land in moving water (which includes rivers, drainage ditches, and surf). It is far better to suffer an injury and recover, than it is to become entangled in your paraglider, parachute, or lines and drown. Water which is not moving is only slightly better. It is still extremely likely that you will become tangled in the fabric or lines. In the hang glider context the results are not much better. If the main carabiner is loose, and the pilot has the presence of mind to swim to the keel and unhook it quickly, then the outcome can be OK. However, there is still the matter of the harness or parachute (if it is not securely in the container). Cold water presents a unique challenge and it may not be possible to swim to shore. It’s also increasingly less likely that there will be watercraft to assist in winter. On one hand, a pilot needs to swim to shore and not get tangled in the equipment. On the other hand, it’s only a matter of minutes before the pilot will succumb to cramps or hypothermia. A pilot in that situation had better have some flotation assistance. Watercraft that come to assist a pilot in the water can also be dangerous depending on how savvy the boat operators are. There is a likelihood that they can ingest lines or fabric into the propeller which can have damning results. There are so many various and different scenarios, this article cannot address all of them. The best approach is to encourage every pilot to do their own due diligence on the subject. 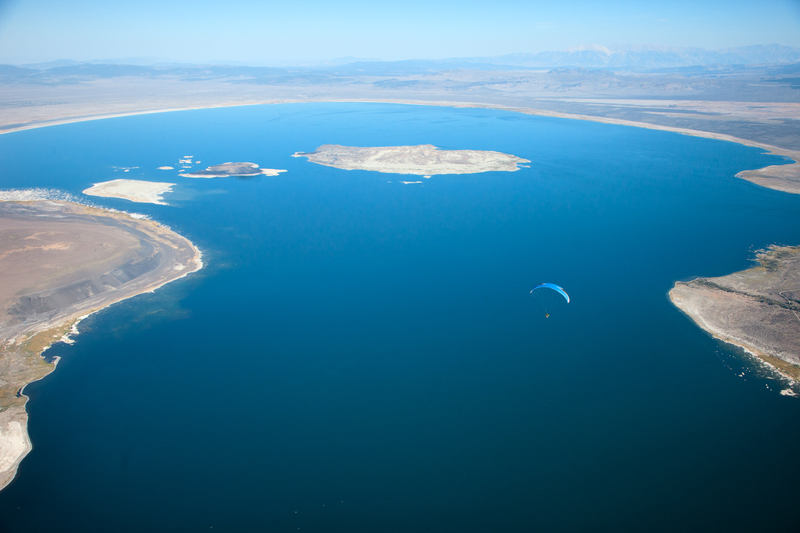 Paraglider pilots are encouraged to study sites carefully for their water hazards and to evaluate the risks associated with flying these locations. In some cases, the landing area is next to a river or on a beach. It borders on irresponsible for pilots to not carry some sort of flotation device in these situations. Further, sometimes the normal landing area next to a body of water is not actually suitable for beginner or student activity. Instructors are encouraged to do their own risk evaluation on this subject. There is some good news. We can learn from the powered paragliding community, where water landings caused the majority of the fatalities for a number of years. Widespread use of emergency flotation has drastically changed the statistics and there have not been any water landing fatalities in several years. This is exceptional and it is our own call to action within the free flight community. A discrete inflatable personal flotation device can be purchased for as little as $50. Moving up to about $100 will provide a pilot a very nice auto-inflate flotation device that is very discreet and can be worn without any downside. We suggest that every responsible pilot should carry one.